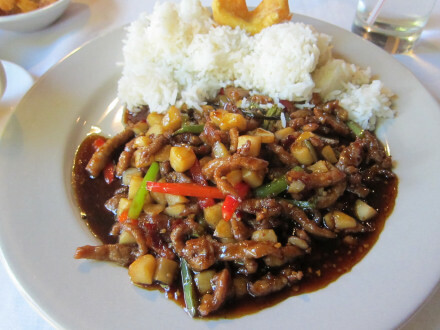 Although Lucky Palace is thought by some to have the best Chinese food in the Shreveport area, and even described as having Chinese food “like Dallas,” it is quite easy to miss. 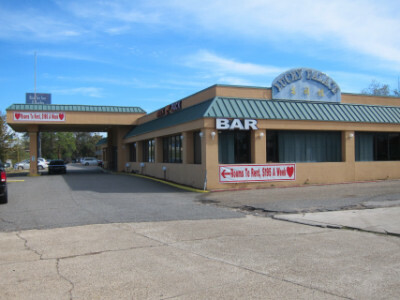 The location is straightforward (at an exit of I-10) and I knew about it being inside the Bossier Inn and Suites Motel, but I still missed the entrance to the motel until making a second try. Once inside the building I did not see the restaurant but the desk clerk pointed me in the right direction. 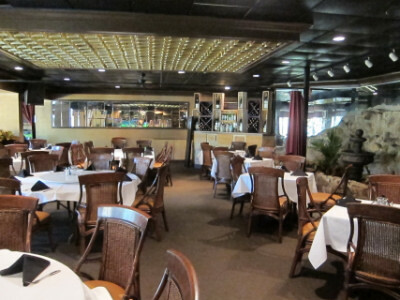 Once inside, though, I found an upscale restaurant with a view of the outdoor patio through plate glass windows, a wine bar, and a rather impressive menu (although without the special Chinese menu found at many Dallas restaurants). The soothing jazz and classical music in the background turned out to be a theme I found in various Asian restaurants throughout Louisiana, and the restaurant was non-smoking. Prices were in line with the more upscale food served, although by upscale I do not mean the type of large family style dishes served in large cities. It is good quality food, and the dishes are the type that I think most people would enjoy for lunch or dinner. There are two types of appetizers here–those that come with the meal and those that can be ordered separately. 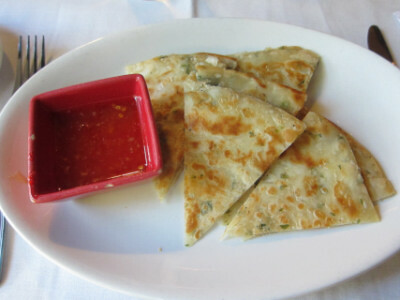 I chose one of the latter, the Scallion Pancakes, because it had been reviewed as one of the restaurant’s “authentic” dishes. I had to agree that it was authentic and very good, but I will tell people who are not as intent on trying different dishes as I am that you will get plenty to eat with the regular dish (and will likely be more than full without ordering an extra appetizer). 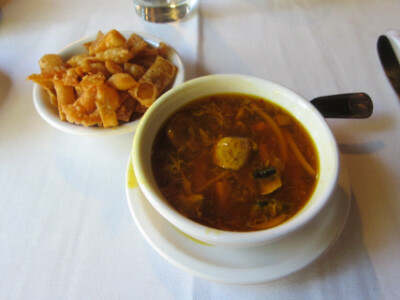 Hot and Sour Soup is one of the soup choices which comes on the lunch menu with any selection, and I would definitely recommend it. This had a very good flavor and a substantial amount of ingredients in the soup. I made a note that this was better than any hot and sour soup I knew of in Oklahoma City (I mean this as a suggestion that you should definitely try this one if you like hot and sour). The Pork with Garlic Sauce had a sauce that I thought was a little sweet, but the meat, vegetables, and sauce were all good with this one stipulation. The large amount of water chestnuts and other vegetables were very enjoyable, and overall I thought this was an excellent dish. I would have preferred it to be more spicy because it would have helped the allergies I was suffering that day, but the flavor of the dish was good with the amount of spice it had. 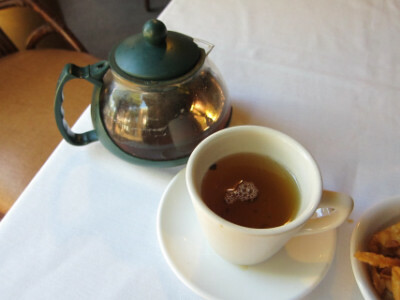 They served a brewed jasmine tea which I thought was excellent (I think the dark spot in the tea is a loose leaf which came from the brewing process). 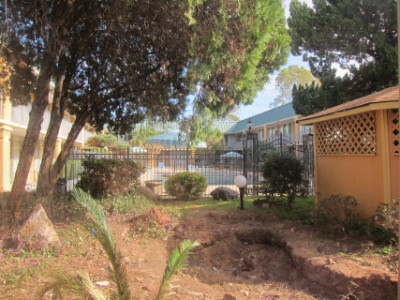 The restaurant is located in an aging motel with a hard-to-find entrance and other problems (such as the bathroom not being accessible). The food is good, though, and the restaurant is very pleasant. This restaurant is not like the ones in Dallas in the sense of having a “Chinese menu” (usually a separate menu written in Chinese), butI the scallion pancakes and a few other items are authentic, and in my opinion the garlic pork was certainly close enough. The big bonus was the hot and sour soup, which was just about the best I have ever had. I did not have any problems with MSG, but it will have MSG unless you tell them otherwise. I have to assume that the amount in the hot and sour soup was very small since I ate this along with the other food. This entry was posted in Shreveport. LA by Steve. Bookmark the permalink.